"The primitive mind isn't all bad, and sometimes it's essential." Everyone would probably agree that attention is too scarce. If we can do something well enough without paying attention, then that's how we do it. We do not have enough attention to micro-manage our lives. But although our limited attention can cause problems, it is not necessarily a design flaw. This brief opinion piece is a good extension of my earlier post, Driving on Autopilot. From the Los Angeles Times comes this story of a woman who lived in an iron lung from the age of 3 until her recent death at age 61. For those not old enough to know what an iron lung was, the photo above (from the Times story) will probably surprise you. The woman, Dianne Odell, lived a remarkable life despite being confined to the machine. She graduated from high school, took college courses, wrote a children's book, and even participated in local politics by telephone. 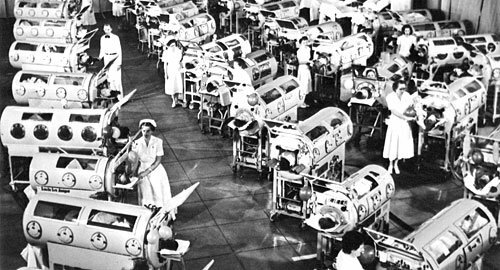 Iron lungs are no longer made because they were replaced by smaller ventilators that allowed patients to be more mobile. However, according to this article, Dianne Odell could not use the newer equipment because of her spinal deformity. She survived in her iron lung for nearly 60 years because of the love and dedication of family and friends. I have now enabled comments for new posts. When I created this blog I did not enable comments because I did not have the time to moderate them. I still don't really have the time, but I'm interested in the conversation. Since comments are moderated, it may be a (short) while before you see your comment here. Only appropriately relevant comments will be approved. Please, no offensive language or personal attacks. Let's see where the conversation takes us. . .
Journal writing can be therapeutic for anyone, but in this article Pamela Stokes Eggleston explains how it can be particularly helpful for military spouses. She sensitively explains how she has used journaling while her husband was in Iraq and since his return. She has some good advice on how anyone under stress can use a journal for personal care. Debra Bailey has a wonderful post about synchronicity over on her blog Soul Mosaic. Please, do go over there and read it. Suicide victims who were abused as children have clear genetic changes in their brains, Canadian researchers reported on Tuesday in a finding they said shows neglect can cause biological effects. Scientists hope that more research such as this might lead to screening tests that would allow treatment and possible prevention of future suicide. About 25 years ago I tried to get help for two young girls in our neighborhood who were being neglected. But, officials at the state abuse hot line told me, as long as there were no welts, bruised, or other visible signs of abuse on the children, nothing could be done. Research like this suggests that all types of abuse, including neglect, leave marks if we just know how to look for them.